Environmental Stewardship became a Waterkeeper Affiliate organization on September 23, 2016. 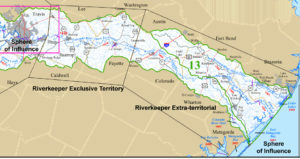 As a new Waterkeeper Affiliate, Environmental Stewardship works to protect and preserve the Texas Colorado River, associated aquifers, and the bays and estuaries of the Texas Gulf Coast by combining its first-hand knowledge of the waterway with an unwavering commitment to the rights of the community, to ecological health of waterways and aquifers, and to the rule of law. 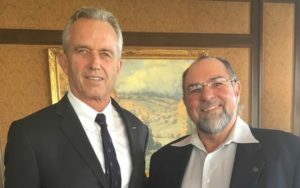 Robert F. Kennedy, Jr. and Steve Box in Austin, TX. Environmental Stewardship’s exclusive and extra-territorial jurisdiction. Environmental Stewardship’s Waterkeeper territory (Austin-Bastrop-Smithville-La Grange River Corridor) – As a Waterkeeper Alliance Affiliate Environmental Stewardship provides oversight of the 110-mile free-flowing section from Longhorn Dam to south of La Grange, Texas. This segment is located immediately below Austin in Travis County, and flows through Bastrop County and Fayette Counties. ES’ Waterkeeper exclusive territory is two state classified segments that are designated for contact recreation, exceptional aquatic life, and as a public water supply. These segments have habitat characteristics that are outstanding for their natural variability, an exceptional species assemblage, an abundance of sensitive species, exceptionally high species diversity and richness, and a balanced trophic structure. The “exceptional aquatic life” designation requires that the segment meet the highest standards for temperature, pH, dissolved oxygen, chlorides, sulfate, total dissolved solids, and bacteria. This portion of the Colorado River has been identified by the Texas Parks and Wildlife Department (TPWD) as an ecologically significant stream segment due to the presence of the state threatened blue sucker and the stream segment’s overall use. 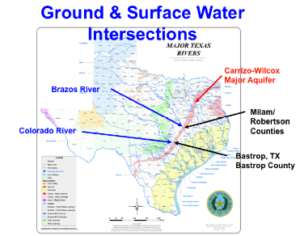 ES, as a member of the Colorado-Lavaca Basin and Matagorda and Lavaca Bays Area Stakeholder Group (CL-BBASC), helped establish environmental flow standards for all segments of the river. The Colorado River intersects the Carrizo-Wilcox Aquifer between Austin and Bastrop, TX. The Colorado River gains water from most of the aquifers it intersects as it flows from the Longhorn Dam below Austin, Texas, to Matagorda Bay on the Gulf Coast. The map to the right shows the location of the Carrizo-Wilcox Major Aquifer in relationship to the Colorado and Brazos rivers (Red is the outcrop or recharge zone). The aquifer extends across the state. Of critical importance is the central Texas section of the aquifer where the Colorado River and the Carrizo-Wilcox Major Aquifer intersect just above Bastrop, Texas. The river is estimated to gain in excess of 25,000 to 50,000 acre-feet per year in this segment. This amount of base-flow contribution to the river becomes especially important during times of drought and extreme drought when flow from the Highland Lakes can be suspended by an emergency order. Waterkeeper Alliance is a global movement uniting over 300 Waterkeeper Organizations and Affiliates around the world and focusing citizen advocacy on issues that affect our waterways, from pollution to climate change. Waterkeepers patrol and protect more than 2.4 million square miles of rivers, streams and coastlines in the Americas, Europe, Australia, Asia and Africa. For more information on Waterkeeper Alliance please visit: www.waterkeeper.org. Logo with flags representing the 35 nations where WATERKEEPER Alliance and affiliated organizations are active.